Source: CICH graphic created using data adapted from the Indigenous Children’s Health Report: Health Assessment in Action, 2009, Janet Smylie & Paul Adomako using data from the 2006 Aboriginal Children’s Survey and 2006 National Longitudinal Study on Children and Youth. http://caid.ca/IndChiHeaRep2009.pdf -accessed July 28, 2017. 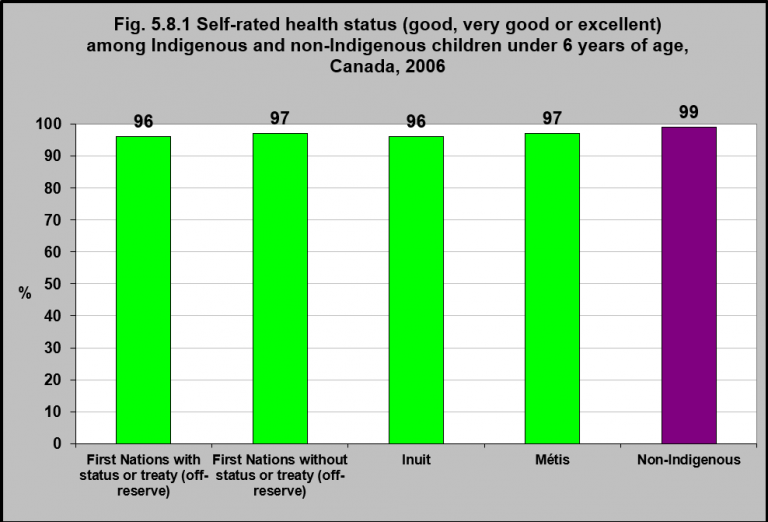 In 2006, the majority (96-97%) of parents and guardians of First Nations children living off reserve, Inuit children and Métis children under 6 years of age reported their child’s general health was good, very good or excellent. This was very similar to that of non-Indigenous children under age 6. 1Wu, S., Wang, R., Zhao, Y., Ma, X., Wu, M., &an, X,. & He, J. (2013). The relationship between self-rated health and objective health status: A population-based study. BMC Public Health, 13, 320. 2Bombak, A.E., & Bruce, S.G. (2012). Self-rated health and ethnicity: Focus on Indigenous populations. International Journal of Circumpolar Health, 71, 10.3402/ijch.v71i0.18538. 3Loiselle, M., & McKenzie, L. (2006). The wellness wheel: An Aboriginal contribution to social work. Waterloo, ON: Paper presented at Breaking barriers and creating common ground through a holistic approach: The Medicine Wheel, the First North-American Conference on Spirituality and Social Work, May 27. Retrieved October 10, 2017 from http://www.reseaudialog.qc.ca/Docspdf/LoiselleMcKenzie.pdf.